Long-term dental health is built on a foundation of good hygiene habits instilled at an early age. Consistent, daily hygiene not only makes for healthy teeth and gums but an attractive smile too. 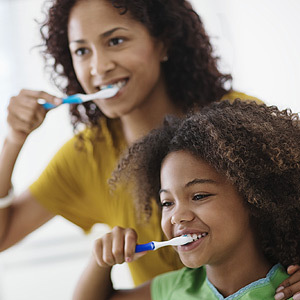 Here are 4 tips for encouraging your child to develop effective oral hygiene habits. Begin teaching them to brush and floss on their own around age 6. Brushing and flossing are the primary ways to remove bacterial plaque from teeth, the main cause for dental disease. You should begin brushing your child’s teeth when they first appear; around age 6 you can begin encouraging them to brush for themselves and learn to floss. Promote healthy eating and snacking habits. A nutritious diet is also important for maintaining healthy teeth and gums. Make sure your child is eating a varied, balanced diet of whole foods in appropriate portions. You should limit sugar and other carbohydrates (which accelerate growth of decay-causing bacteria) to mealtimes; offer limited, non-sugary snacks between meals. Warn older children and teens about practices that are unhealthy for the mouth. As children enter their teen years, they’re under increased pressure from peers to try unhealthy practices. Oral piercings like tongue and lip bolts can increase tooth damage — chipping and wear — and gum recession, infection and bone loss. Tobacco use, both smoke and smokeless, can also cause tooth staining, increase the risk of decay, gum disease and oral cancer. Begin stressing the dangers these practices pose to their general and oral health before they reach puberty. Practice what you teach. Â Modeling healthy behavior you want your child to learn is just as important as instructing them how to do it. When they’re very young, brushing teeth should be a family affair — allow them to see how you brush your teeth as you help them brush theirs. And, if you’re not sure if your hygiene techniques are worthy of emulation, we’ll be glad to help you improve your effectiveness to pass on to the next generation.